Category Custom Settings is an addon for Post Pay Counter that allows to set custom settings for each category. This is ideal for sites where authors write different kind of contents of different value that should be paid differently. 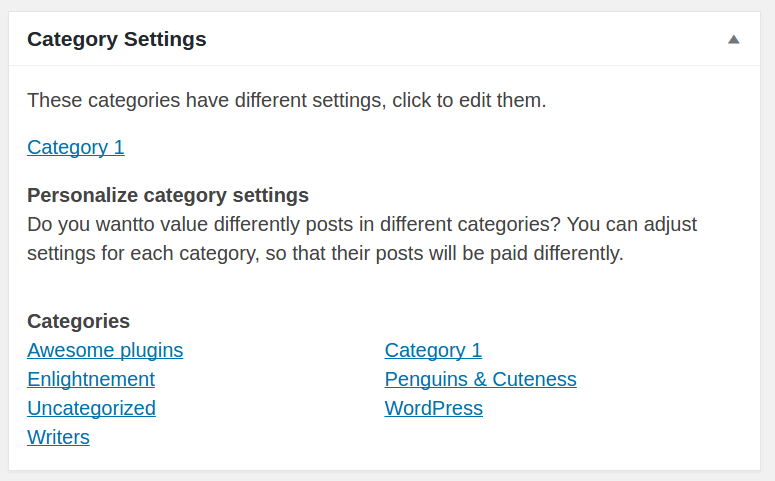 Custom category settings apply to all posts belonging to that category, written by any author. All posts which don’t fall in a category with special settings will just use general settings, or, when available, settings specific for the author. The addon creates a new Category Settings box in the Options page, very similar to the Personalize Settings box. 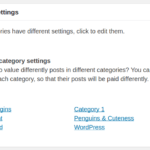 If a user has custom settings, it does not matter whether his posts are in a category with custom settings. User custom settings have priority anyway. First of all, make sure you have the latest release of Post Pay Counter installed and active. As soon as you purchase the addon, you will get an email with the download link and your license key: download the plugin through that link, extract the zip and upload its content (the whole ppc-category-custom-settings folder) to your WordPress wp-content/plugins folder. Now head over to your website plugins list page, look for Post Pay Counter – Category Custom Settings and activate it. Finally, go to Post Pay Counter > Options > License status, paste your license key in the apt field and hit Submit. You’re done: your license has been activated and you can now enjoy all the new features, which you may find in the Category Settings box (after refreshing the Options page).